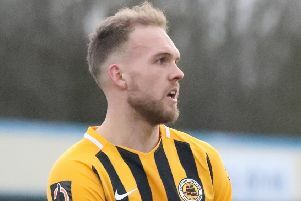 In a frustrating campaign, the Pilgrims boss cut a particularly unhappy figure following a 3-0 defeat at Blyth Spartans on Saturday. “I think it’s one of the worst of the season,” Elliott reflected. “It’s hard to digest to be honest, the bare requirement you want from a player is to be hard to play against. Application. Effort. “And honestly, I think, 10 or 11 can be labelled that they downed tools today. Michael Liddle, Sean Reid and Dan Maguire netted the winning goals for the hosts at Croft Park. While Elliott described midfielder Brad Abbott as ‘head and shoulders above anyone else on that pitch’, few others escaped his ire. “(It was) bordering on embarrassing. They were awful goals ( to concede),” the manager added. “I don’t want to take too much away from them, they’re a good team. But we made life easy for them. Maguire and Kieran Green saw early efforts fly wide of George Willis’s goal before the United keeper get enough behind Robbie Dale’s free kick. Dale teed up Liddle to open the scoring with five minutes of the first half remaining, Willis beaten at his near post. And it was Dale who assisted Reid to head home minutes into the second 45. Blyth were down to 10 men in the 76th minute when Louis Laing’s high boot cut Abbott’s nose and the player was dismissed. But the Spartans had the final say when Maguire found the net, late Boston efforts from jay Rollins and Max Wright unable to reduce the deficit. SPARTANS: Jameson, Nicholson, Laing, Atkinson, Liddle, Mullen, Green (Buddle 74), Rivers, Reid, Dale (Wrightson 74), Maguire (Watson 83); Subs (not used): Horner, Butler.